The Nigerian Army has, as a matter of record, written to Huhuonline.com to explain its version of events in the disputed procurement contract of military supplies to the Nigerian contingent serving in the hybrid African Union-United Nations peace-keeping force in Darfur Sudan. Huhuonline.com broke the story about the imminent legal fracas pitting military contractors against the Federal Government for contracts the army awarded to Esquire Ventures Ltd; Profitel Ltd, Century Communications Ltd and Jonny-Way Investments Ltd ) for the supply of military hardware to the tune of N1.2 billion. (a) The sum of N476,448,000 being the contractual price of the good supplied to the Nigerian Army with 21% interest per annum from August 2008 till judgment is entered and 60% interest on the judgment sum until it is liquidated. (b) The sum of N100,000,000.00 as general damages for breach of contract. (c) The sum of N530,700,000 being the purchase price of the remaining items for which our clients have already committed part payment to the manufacturers, production of which is ready for shipment. Or alternatively, the sum of £358,000 paid as deposit by our clients to the manufacturers in respect of the remaining items with 21% interest per annum from February, 2008 till judgment is entered and 60% interest until the judgment sum is liquidated. But, in a statement by Brigadier General Chris Olukolade, the Army's Director of Public Relations, the Army discounted the claims as false, saying they are shrouded in public incitement and libel aimed at undermining the integrity of the leadership of the Nigerian Army. The attention of the Nigerian Army has been drawn to the persistent efforts through publications ostensibly sponsored by some individuals who claim to be contractors to the Nigerian Army. The publications, some of which have appeared on the website http://www.huhuonline.com and some national newspapers, suggest that the Nigerian Army is owing them substantial amounts of money. They went further to make a number of insinuations which are completely false and aimed at undermining the integrity of the leadership of the Nigerian Army. The Nigerian Army has, through investigations, come to the full realization of the fact that these group of persons are not only given to the application of some clandestine approaches to defraud the taxpayers and unsuspecting members of the public, but also have a strong sense of disdain to the principles of due process, transparency and accountability. 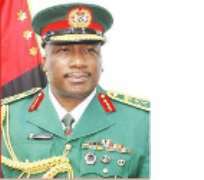 Although the characters behind the claims and the allegations have been well known to the Economic and Financial Crimes Commission (EFCC), the army is also wary of the fact that their present line of actions are orchestrated by the anger evoked by the avowed commitment of the leadership of the Nigerian Army to stick to the direct labour and direct procurement approach in the execution of its key projects. We want to emphasize that these arm-twisting and clandestine campaign notwithstanding, the Nigerian Army shall not be dissuaded from this track which has not only assured her of high quality of project execution, but has also cut down on the cost of executing such projects, especially at this period of economic melt-down. The Nigerian Army strongly believes that the grand motive behind all the falsehood and unwarranted attacks through the media is to cow the army to submission in order to have it distracted from the path it has already charted for itself. We wish to, however, assure members of the military community and the Nigerian public in general, that we remain undaunted and can never be detracted from the path of propriety and transparency no matter whose ox is gored. In threading this path, the army shall continue to count on the support and goodwill of the Nigerian people. The much respected media in particular, is strongly advised to exercise due restraint in interacting or identifying with the mission and message of these Pseudo-contractors and twin agents of fraud and destabilization. This is more so as their campaign materials are shrouded in public incitement and libel.